Spider-Man's hype and box office may have stolen some of Episode II's thunder, but Attack of the Clones finally arrives, three years after its predecessor, The Phantom Menace, and picking up the story 10 years after that installment let off. The story is considerably more convoluted this time out. Former Queen Amidala (Natalie Portman) is now a senator in the Republic, and nefarious parties are repeatedly attempting to have her assassinated. Assigned to protect her are Obi-Wan Kenobi (Ewan McGregor) and a growing-up Anakin Skywalker (Hayden Christensen), now Obi-Wan's apprentice. Soon, Jedi bosses Yoda and Mace Windu (Samuel L. Jackson) split the two up: Obi-Wan is tasked with tracking down the bounty hunter who tried to kill Amidala (which turns out to be Jango Fett (Temuera Morrison), father/clone of young Boba Fett). 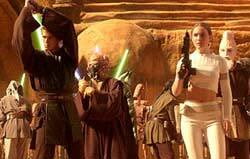 Anakin is tasked with serving as Amidala's bodyguard. Obi-Wan scours a "secret" watery planet (there discovering a massing clone army allegedly purchased for the Republic ten years ago), and then tracks Jango to another planet, where he finds the opposition led by (try not to snicker) Count Dooku (Christopher Lee), who is amassing a droid army for war against the Republic. Meanwhile, Amidala and Anakin fall in love (awwwwwwwwwwwww), but since she's a politician and he's a Jedi (bound to supress emotion -- which just ain't takin'), they have to keep their romance a secret (just like in The Bodyguard!). Side stories galore take characters all over the galaxy far, far away... including the inevitable stop on Tatooine to help Anakin's mother and long spells on Coruscant, the 100%-urban capital planet. On to the nagging questions: Foremost, Jar-Jar is back, and his part is not insubstantial; the character is as grating as ever. But all eyes are on Christensen, and he fills the shoes of Skywalker admirably, though he has apparently been given the sole direction to act like a really bratty teenager. The use of CGI is on overload, and while many of the sets (real or digital) are quite successful, many of the backdrops are not -- notably the cheesy oceans on the clone planet and an especially flat cathedral-like hallway Yoda scoots through. When the CGI interacts with real-world elements (like when Anakin rides a fat sheep-like creature), the effect is about as believable as Barney being a real dinosaur. Also out of place is the movie's silly patriotism, with frequent pontification about loving democracy (and this from a former queen -- albeit an "elected" queen... uh, okay) and the Republic. One speech actually includes the earnestly corny line, "The day we stop believing in democracy is the day we lose it!" I say the day Star Wars becomes nothing more than a political platform is the day we lose it. At 2 1/2 hours in length, this installment is a bit long-winded and bladder-challenging (compared to 2:13 for Episode I and a little over 2 hours for A New Hope), but the decision to go "epic" at least makes room for lots of action when Amidala and Anakin aren't busy smooching. The action starts right at the beginning, with an impressive skycar chase through Coruscant, and ends with an equally smashing "big battle scene" that easily outdoes the one in Menace. Best of all, though, is the already famous Yoda light-saber battle, which is as funny as it is thrilling. That said, the pod race in Phantom is still probably the best action sequence in the series so far. Less impressive are the talky parts, which haltingly attempt to create a romance between Amidala and Anakin. The love story just doesn't work and it's very awkward, maybe because George Lucas is simply out of touch with the realities of youthful romance, or maybe because the leads didn't have chemistry. I don't know for sure. I do know, however, that if Anakin Skywalker is going to play the cool outcast he shouldn't act like a baby around his would-be girlfriend. And Amidala's 11th hour confession of love comes completely out of left field, a necessary plot point because we know she has to eventually bear two kids by the guy. In fact, much of Episode II feels like it's ticking off items to make sure we get to the appropriate state of the galaxy by the end of 2005's Episode III. There's still a long way to go -- Anakin has to turn evil and disfigured; Amidala has to have two kids, split them up, and have one become the princess of a planet still not introduced in the series; Yoda and Obi-Wan have to become hermits; and then there's the matter of the Death Star, which has to be built. Episode III is either going to be a complete disaster or a work of genius. Altogether, the movie is enjoyable despite its nagging script inadequacies and crummy "down" scenes. The action is fun, the acting is good enough, and the direction is capable, if not inspired. If you're a die-hard Star Wars fan, you will like this better than Episode I (though I grade them roughly equal), but it still won't hold a candle to the earlier films. But chances are when it's said and done, you aren't going to be talking about Episode II for its good things. An impromptu conversation with another filmcritic.com staffer set us off on a number of incongruities and simply baffling moments that might be pointing to Lucas's senility. For example: When did R2-D2 become able to fly? When did Obi-Wan become afraid of flying (or afraid of anything for that matter)? What's with Jimmy Smits and his Elizabethan collar? Since when does a Jedi Knight have to go to a library to figure out where a planet is? And why didn't Lucas get the hint about Jar-Jar Binks the first time around? Mysteries of the universe, I tell ya. The DVD answers few of these mysteries, with eight deleted scenes (see Natalie Portman lose her accent!) and various effects-oriented documentaries. There's even a trailer for a mockumentary about R2-D2. Amusing.